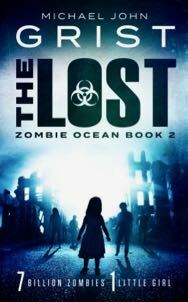 The Lost is Book 2 in the Zombie Ocean series, and a zombie apocalypse story with a twist: the hero is a 5-year-old girl. 7 billion zombies. 1 little girl. Anna is one of them. She’s five years old. She likes banana milkshakes and Alice in Wonderland. She’s alone in a world she cannot understand. ‘Alice in Wonderland’ smashed up with the zombie apocalypse like you’ve never seen it before, packed with gore, twists and the delightfully surreal. I loved The last , can’t wait to read the rest of them . Thought I’d just about had it with Zombie apocalypse…until The Last. Funny, emotionally draining and very exciting. Zombies thru a humanitarian rifle scope – sort of. Great stuff. Looking forward to continuing the series. Thanks, Julian, that is great to hear! I may have to steal ‘zombies through a humanitarian rifle scope’ – nails it, really.